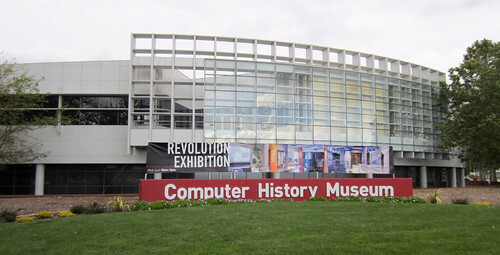 If that phrase, "face down, nine-edge first", brings back memories then plan to visit the Computer History Museum in Mountain View, California. 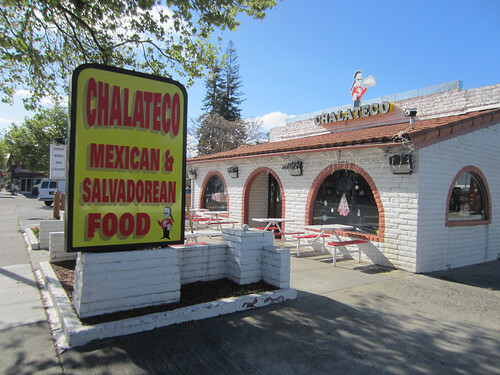 It's located immediately east of Highway 101 at exit 399 (Shoreline Blvd.) This is just 25 miles south of the car rental returns at SFO. Closed Monday and Tuesday. Otherwise, get there well before it closes at 5:00 p.m. You will need at least a couple of hours for the self-guided tour if you had anything to do with computers in the 1950s, 60s or 70s. The current exhibit is titled "Revolution." It does a very thorough job of covering a wide period of computer history. I'm going to break this tour up into two separate pieces. 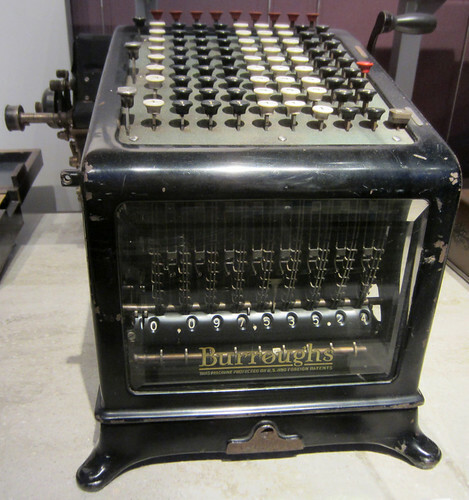 This first one will cover just a few exhibits during the era of calculators through punch cards. The second part will show you some of the computer exhibits. I was disappointed to find that the ElectroData Datatron 205 which was exhibited previously has been returned to storage. "It didn't make the cut," noted the archivist. Apparently, I wasn't the first to ask, since she had been questioned about the lack of Burroughs equipment recently by another visitor. So let's start our tour with the Burroughs adding machine that is part of the current exhibit. They have a good specimen from 1912. Unfortunately, the exhibit passes pretty lightly over what made Burroughs' adding machine special. Look at the back of the machine. It printed a tape with both the entries and the total. Revolutionary stuff in the late 1880s. 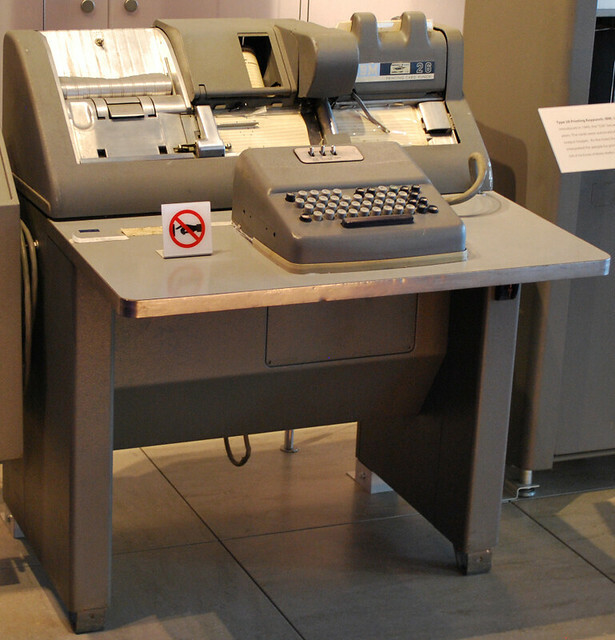 Can't you just imagine the excitement in the eyes of a merchant or banker at seeing a printed audit trail coming out of the Burroughs "Adding and Listing" machine versus the numbers displayed on dials on the competitor's Comptometer? Burroughs salesmen in the early 1900s were going from town to town selling their machines for $475 ($125 stayed with the salesman - that could buy 2 horses). "Gather round boys," the salesman would say in the bar, "I have a machine that can add numbers and print the results faster than any man in this room! And, it never makes a mistake." A lot of bets were made on that claim. Also in this area of the exhibit is a good example of a Marchant calculator. 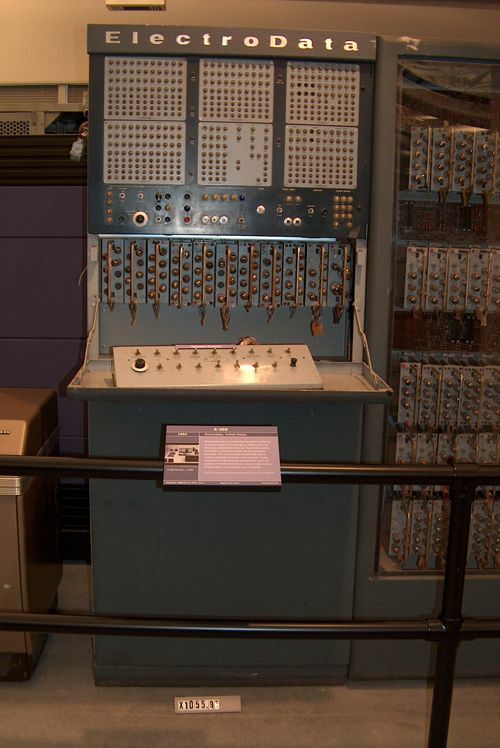 Marchant was the Cadillac of calculators used by mathematicians, engineers and astronomers up through the end of World War II. It was smooth-operating and fast. See this chapter of Herb Grosch's autobiography, 2500 hours on a Marchant for more details. 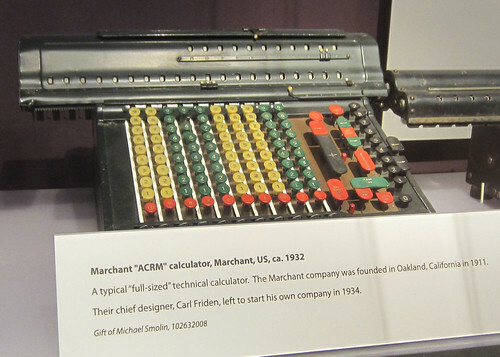 Marchant calculators were made across the bay in Oakland. But their chief designer was a fellow named Carl Friden. Friden worked for Marchant beginning in 1918 but then started his own company a bit further south in San Leandro in 1934. I found this picture of the Friden factory over in the San Leandro library. Over in another corner of the exhibit there is a great collection of IBM punched card equipment. 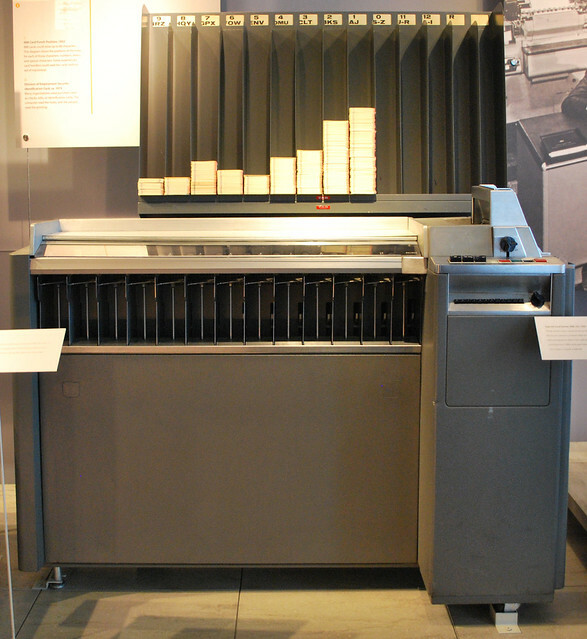 Besides some very early machines there is a mint-quality group machines from the 1950-60 era. I haven't seen a sorter like this one in years, much less the bins with cards hanging above it. 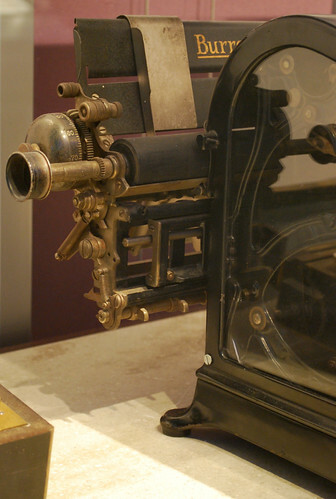 I photographed just the "business end" of the collator. The model 026 keypunch should bring back lots of memories. O yes, which way do you place those cards in the hopper on the sorter or the collator? Well, face down, nine-edge first, of course. One of my cousins was celebrating his 80th birthday out in Hayward, California, this month and that seemed like a good reason to spend several days in the area. I had several items on my to-do list that I could take care of. I decided to stay in Palo Alto to have easy access to both sides of the bay. 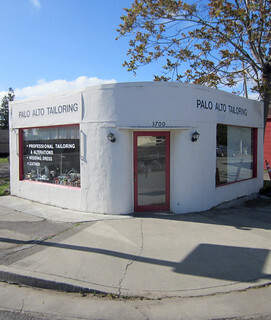 Palo Alto still looks very "California" to me. 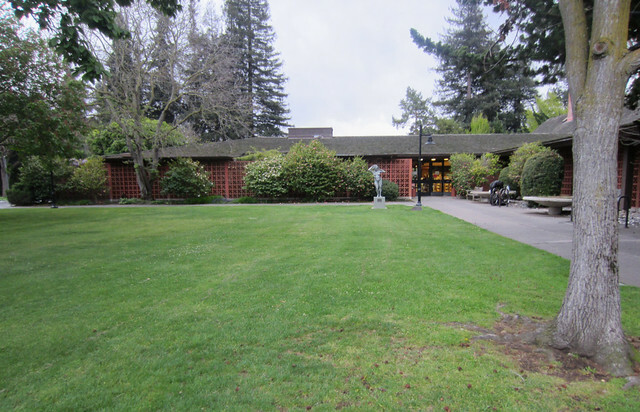 It is hard to describe that look, but here is the main library in Palo Alto. See what I mean? 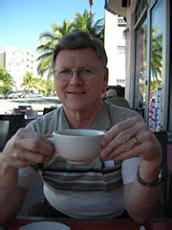 I stayed at the Comfort Inn on El Camino Real, a road with a long history. While Stanford University can be thought of as the heart of Palo Alto, the 64,000 residents aren't limited to the typical college town's students and faculty. For example, here is Steve Jobs' house and his neighborhood as portrayed on Zillow. I'm told that Jobs had the only slate roof in Palo Alto. Many of the homes in Jobs neighborhood look like a modest three-bedroom place owned by an engineer or teacher. Market value, $150k-$250k in the midwest. Those are the ones for sale or valued at $1.3 million. You can see from the Jobs block that two, three or more of these small lots are being assembled into larger parcels and the homes replaced with big homes. Median Income? Well, here's a fellow that "surveyed the literature" and came up with multiple answers. I would vote for median household income somewhere north of $150k, however. College towns usually have good food and Palo Alto is no exception. I had a very good Indian dinner, a great Afghan lunch and a couple of other good meals in the town. There were so many choices, I never did get to sample the Salvadorean choices here. The downside/upside to dining alone in a college town can be the conversation at the next table. I spent one evening listening to a 45-minute conversation about comma placement in a wide variety of sentence structures. What's your guess? Journalism students? English majors? I am so glad that I'm not still in school! 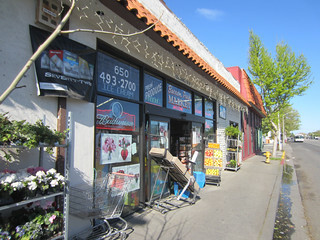 And while there are quite a few small strip malls and a huge Frye's Electronics in the vicinity of the motel, there is still plenty of that local California character too. Especially along El Camino Real. This grocer and tailor shop are a couple of samples. Northwest Wisconsin bills itself as "Wisconsin's Vacation Land." Even the Chicago gangsters appreciated the relaxed pace of life here during prohibition. But finding a good place to eat in Burnett or southern Douglas county can be difficult. And the local places don't make it easy. Maybe they don't want too much "drop-in" traffic! For instance, you might be headed along Wisconsin highway 77 between Danbury and Minong on your way to Hayward, home of the Freshwater Fishing Hall of Fame and many festive activities such as the Honor The Earth Pow-wow. It would be easy to miss this sign near the Webb Lake town hall. 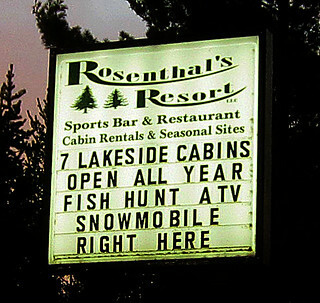 But, just a quarter mile south of the Webb Lake town hall, you will find Rosenthal's Resort. 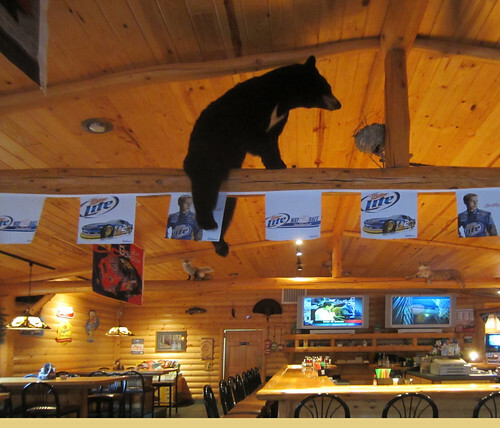 This is northwest Wisconsin fine dining at its best. Just consider the atmosphere alone. You have a black bear checking out a beehive. 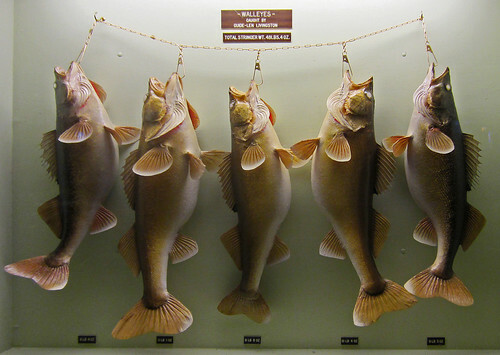 And look at the stringer of nine-pound-plus Walleyes. My personal favorite here is the chicken Alfredo but you might just want to try the Walleye. Worth a stop and highly recommended! We were anxious to "head up to the lake" after our winter in the Florida panhandle and we headed north on March 23rd. 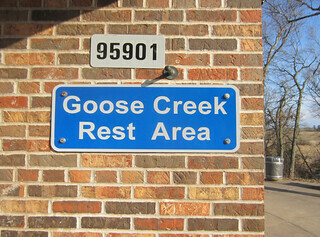 We stopped along the way at the Goose Creek Rest Area along Interstate 35. 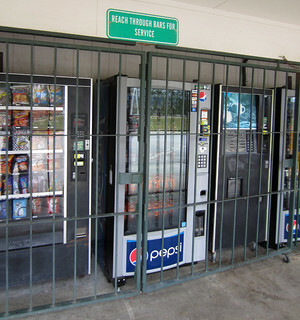 It was good to be back home where the pop machines are not behind bars as along Interstate 95 in Florida. And look at this. 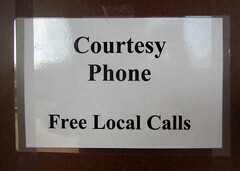 A free telephone for local calls with a phone book. 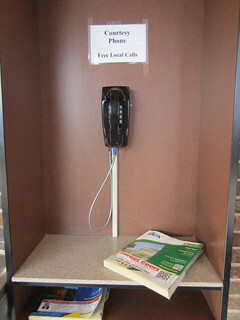 And the phone book is not only present, it has neither a chain nor a cable to keep it there! 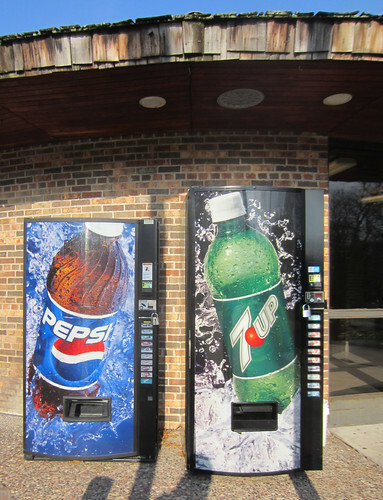 Now, let's take a look at the historical marker out in front of the rest stop. It's a wonderful description of Minnesota's Arrowhead Region, with mention of the North Shore, the Gunflint trail, and Split Rock Lighthouse. All are genuine attractions, but there is just one problem. 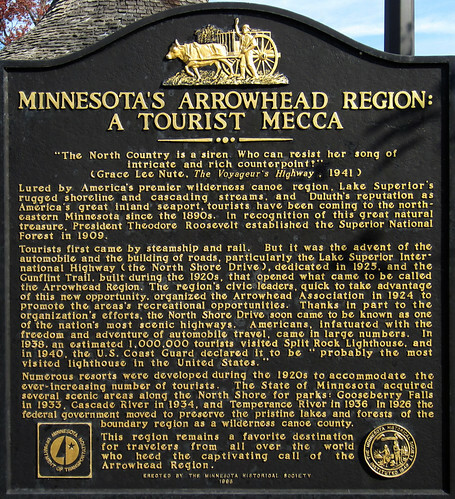 The Arrowhead region of Minnesota is located a bit more than a hundred miles north of where this marker lies! It is the triangular shaped piece of territory above and to the right of marker "B" on this map. You are standing at marker "A". 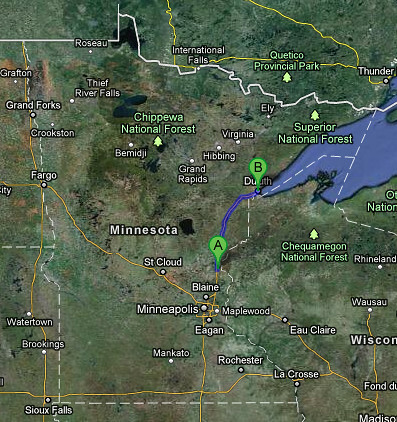 And getting to Split Rock Lighthouse is another fifty miles beyond marker "B".